Mocht u kanker-actueel de moeite waard vinden en ons willen ondersteunen om kanker-actueel online te houden dan kunt u ook via uw lidmaatschapsnummer korting krijgen bij enkele bedrijven. 17 januari 2017: Bron: Cancer Causes Control. 2011 Mar; 22(3): 427–435. Fysieke activiteit zoals bewust bewegen en sporten heeft grote invloed op het risico aan overlijden voor borstkankerpatiënten die 1 jaar na hun behandelingen nog in leven zijn. Borstkankerpatienten die bij de start van de studie al veel actief waren en dit door bleven zetten tijdens en na hun behandelingen hadden 52% minder risico op overlijden in vergelijking met borstkankerpatiënten die weinig fysiek actief waren voor en tijdens hun behandelingen en daar ook niets aan deden. Vrouwen die bij de start weinig actief waren maar na hun behandelingen wel fysiek actiever werden reduceerden daarmee hun kans op overlijden met 35% tot 42%. Opvallend was dat de vrouwen die niets veranderden in hun fysieke activiteiten na 1 jaar ook geen wezenlijke veranderingen zagen in hun kans op overlijden. Dus borstkankerpatiënten die toch al wel fysiek actief waren bleven zelfde minder risico op overlijden van ca. 50% te hebben in vergelijking met borstkankerpatienten die weinig fysiek actief waren zowel bij de start als daarna daar niets aan veranderden. Dit betekent dat op elk moment na behandeling van borstkanker het goed is om fysiek actiever te worden en bv. mee te gaan doen aan bewegingsprogramma's die overal worden aangeboden. Of gewoon zelf meer gaan bewegen, wandelen, sporten enz. Het heeft echt gote invloed op de overall overleving. Het volledige studierapport: Physical activity, additional breast cancer events, and mortality among early-stage breast cancer survivors: findings from the WHEL Study is gratis in te zien. Onze studie suggereert dat het vergroten van fysieke activiteiten voor borstkankerpatienten een positieve invloed heeft op de overall overleving en kwaliteit van leven. Daarom is bevorderen van fysieke activiteiten voor borstkankerpatienten aan te raden. 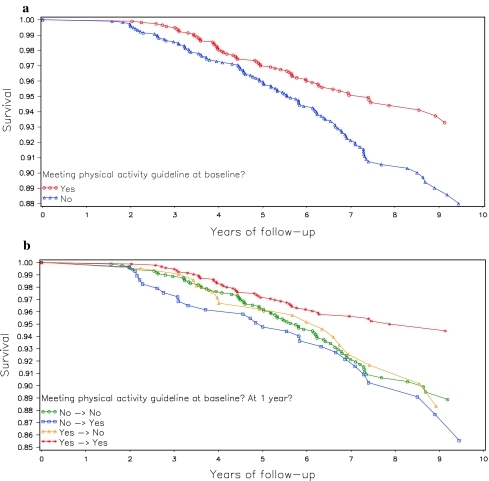 Higher baseline (post-treatment) physical activity was associated with improved survival. However, change in activity over the following year was not associated with outcomes. These data suggest that long-term physical activity levels are important for breast cancer prognosis. Cancer Causes Control. 2011 Mar; 22(3): 427–435. Research suggests that physical activity is associated with improved breast cancer survival, yet no studies have examined the association between post-diagnosis changes in physical activity and breast cancer outcomes. The aim of this study was to determine whether baseline activity and 1-year change in activity are associated with breast cancer events or mortality. A total of 2,361 post-treatment breast cancer survivors (Stage I–III) enrolled in a randomized controlled trial of dietary change completed physical activity measures at baseline and one year. Physical activity variables (total, moderate–vigorous, and adherence to guidelines) were calculated for each time point. Median follow-up was 7.1 years. Outcomes were invasive breast cancer events and all-cause mortality. Those who were most active at baseline had a 53% lower mortality risk compared to the least active women (HR = 0.47; 95% CI: 0.26, 0.84; p = .01). Adherence to activity guidelines was associated with a 35% lower mortality risk (HR = 0.65, 95% CI: 0.47, 0.91; p < .01). Neither baseline nor 1-year change in activity was associated with additional breast cancer events. We found a robust association between level of physical activity at baseline and breast cancer mortality. We did not observe a statistically significant association between baseline physical activity and additional breast cancer events, suggesting that the results for mortality may have been driven by prognosis after an additional event (including a possible effect on type of recurrence) rather than a direct reduction in recurrences or new primaries. Although our analyses used all-cause rather than breast cancer–specific mortality, more than 80% of deaths in the WHEL Study were due to breast cancer ; therefore, the observed association between higher baseline physical activity and lower mortality was largely driven by a reduction in breast cancer–related deaths. Contrary to expectations, changes in physical activity from baseline to 1 year were not associated with survival. It is possible that our 1-year measure of behavior change did not provide a sufficiently long period for the metabolic and physiologic changes associated with increased or decreased physical activity to impact cancer outcomes. Likewise, we observed that the majority of women who adopted physical activity between enrollment and year 1 did not maintain their new activity level over the long term. Our findings with regard to mortality are generally consistent with previous reports [7, 8]. Similar to the Nurses’ Health Study, the Collaborative Women’s Longevity Study, and the Life after Cancer Epidemiology cohorts, we found that a substantial amount of physical activity was required to improve breast cancer outcomes. An exception is the HEAL Study, which observed a benefit for even very modest levels of physical activity. There are a number of potential explanations for between-study differences in the level of physical activity that is associated with reduced mortality. The cohorts vary somewhat with regard to clinical and other participant characteristics. Perhaps more importantly, the specific approach to physical activity measurement and quantification also varies. For example, the Canadian study assessed a wide variety of physical activity settings (recreational, household, occupational) and categorized results by setting type, whereas some other studies focused only on recreational or leisure-time activity and categorized results by intensity (mild, moderate, vigorous, total). Due to these variations, it is difficult to directly compare studies with regard to the dose of physical activity that is necessary to observe a protective effect on outcomes. A strength of the WHEL Study was that we assessed physical activity at two time points, allowing us to assess the potential effect of changes in physical activity on breast cancer outcomes. Other strengths included excellent cohort maintenance (health status confirmed at study end confirmed for >95% of participants) and a multi-site, geographically diverse sample of breast cancer survivors. A limitation of the WHEL Study was the use of self-report of physical activity, which is known to include random error. However, the study used a standardized physical activity questionnaire that was validated against both a physical activity recall procedure and an objective physical activity measure (7-day accelerometer) within a subset of WHEL Study participants . The physical activity questionnaire had good agreement (73%) with the accelerometer measure and had 100% sensitivity for meeting the physical activity guideline. Another limitation is that the WHEL cohort was a fairly racially and ethnically homogenous sample. Thus, findings may not apply to women who are not non-Hispanic White. Consistent with previous reports, our findings suggest that adherence to physical activity guidelines may improve overall survival among breast cancer survivors. We also present the first examination of post-diagnosis change in physical activity. We observed a 42% reduction in risk mortality among those women who were adhering to physical activity guidelines at both baseline and 1-year relative to those who did not meet the guideline at either time point. However, we did not find that 1-year change in physical activity was associated with breast cancer mortality. These findings highlight the importance of sustained post-diagnosis physical activity and suggest that a 1-year period may be too short for even relatively large increases in physical activity to affect breast cancer outcomes. Long-term exposure appears to be the most important determinant of the relationship between physical activity and breast cancer mortality. To improve breast cancer outcomes, women should be encouraged to maintain an active lifestyle over time, aiming to meet or exceed current physical activity guidelines. Toward this goal, physical activity promotion should be incorporated into breast cancer prevention and control programs. Future studies are needed to further examine the potential effect of long-term post-diagnosis change in physical activity on breast cancer outcomes. The Women’s Healthy Eating and Living (WHEL) Study was initiated with the support of the Walton Family Foundation and continued with funding from National Cancer Institute Grant CA 69375. Some of the data were collected from General Clinical Research Centers, National Institute of Health grants M01-RR00070, M01-RR00079, and M01-RR00827. 2. Sternfeld B, Lee I-M. Physical activity and cancer: the evidence, the issues, and the challenges. In: Lee I-M, editor. Epidemiologic methods in physical activity studies. New York: Oxford University Press; 2008. 3. Bull FC, Armstrong TP, Dixon T, Ham S, Neiman A, Pratt M. Physical inactivity. In: Ezzati M, Lopez AM, Rodgers A, Murray C, editors. Comparative quantification of health risks: global and regional burden of disease attribution to selected major risk factors. Geneva: World Health Organization; 2004. Our study suggested that exercise intervention was beneficial to breast cancer survivors. Therefore, exercise should be recommended to this patient group. Onco Targets Ther. 2016; 9: 2153–2168. Exercise is associated with favorable outcomes in cancer survivors. The purpose of this meta-analysis is to comprehensively summarize the effects of exercise intervention in breast cancer survivors. A systematic search of PubMed, Elsevier, and Google scholar was conducted up to March 2015. References from relevant meta-analyses and reviews were also checked. Thirty-three randomized controlled trials were included in this meta-analysis, including 2,659 breast cancer survivors. Compared with the control group, quality of life was significantly improved in exercise intervention group, especially in mental health and general health subscales of short form 36 questionnaire, as well as emotion well-being and social well-being subscales of the Functional Assessment of Cancer Therapy. Besides, exercise alleviated the symptoms of depression and anxiety in the exercise group. Furthermore, exercise was also associated with positive outcomes in body mass index, lean mass, and muscle strength. In addition, the serum concentration of insulin, insulin-like growth factor-II, and insulin-like growth factor binding protein-1 was significantly reduced in exercise intervention group. However, based on the current data of this meta-analysis, there were no significant differences in sleep dysfunction or fatigue between groups. 29. Cantarero-Villanueva I, Fernández-Lao C, Díaz-Rodriguez L, Fernández-de-las-Peñas C, del Moral-Avila R, Arroyo-Morales M. A multimodal exercise program and multimedia support reduce cancer-related fatigue in breast cancer survivors: a randomised controlled clinical trial. Eur J Integr Med. 2011;3(3):e189–e200. Reageer op "Fysieke activiteit van borstkankerpatienten na 1 jaar nog in leven na behandeling heeft grote invloed - 35 tot 52 procent - op kans op overlijden"
Bewegen en fysieke oefeningen verminderen beduidend de kans op sterven aan borstkanker, vooral bij hormoon gevoelige borstkanker en ook na te zijn behandeld aan de primaire borstkanker blijkt uit grote prospectieve studie. Beweging en sporten beïnvloedt oestrogeenwaardes in bloed van vrouwen in de leeftijd na de overgang bewijst een gerandomiseerde studie en suggereert een bescherming tegen krijgen van borstkanker. Lichaamsgewicht bij diagnose speelt bepalende rol in overlevingskansen voor borstkankerpatiënten vooral voor vroege borstkanker stadium I en IIA met estrogeen negatieve receptoren.